Scene: A country road. A dead tree. Two bums sit near the tree. Monny: I thought you were dead. Monny: Did you ever read the Bible? Boydie: The Bible? (Thinking hard.) I must have taken a look at it. Monny: Do you remember the Gospels? Boydie: I remember the pretty maps—in color. Was there a story? Monny: Yep. Two thieves—Are you listening? Boydie: Is this about death? I don’t like death. Let’s go. Monny: We’re waiting for Gordo. Boydie: He’s not coming. I think he’s dead. Monny: Maybe we could hurry this up. We could hang ourselves. Boydie: Won’t that give us an erection? Boydie: I hear something. Look! It’s the Oakster. Monny: (grudgingly). He's not bad looking. Monny: Look at the slobber. Look at the palaver. Boydie: Look at his eyes! Boydie: Bugging right out of his head. Oakster enters carrying a rope with a loop tied around the neck of a young man dressed in a short-sleeved white shirt, a name tag, and with a short haircut. They say I am perhaps not particularly human, but who cares? Look at the sky. (They all look up.) It is still daylight—why don’t you go? When it gets dark, what happens then with your appointment with Gordot . . . er Gordet. . . er Gordin—anyway, you know who I mean—he who has your future in his hands, at least your immediate future. (Aside to the missionary) Short as their future is! Boydie: And it’s not over yet. Boydie: Think? I think not. Monny:. Nothing happens, nobody comes, nobody goes. It’s awful. Boydie: Men’s room is at end of corridor to right. Monny: Give him his hat. He can’t think without his hat. Oakster: Adieu, but don’t write me out of this script. Oakster and missionary exit stage. Boydie: That passed the time. Monny: It would have passed in any case. Boydie: Yes, but not so rapidly. Monny: What do we do now? 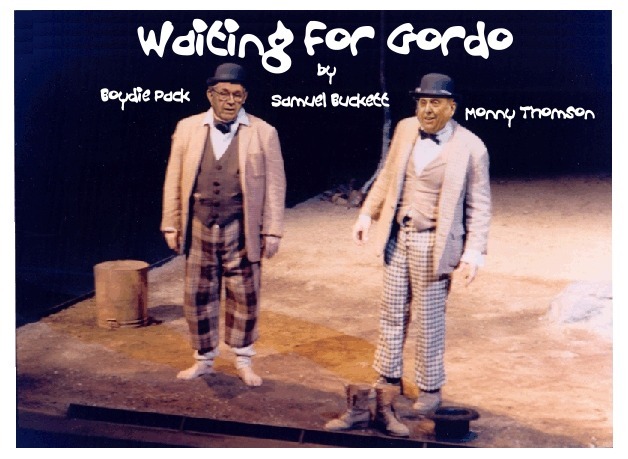 Monny: We're waiting for Gordo. Boydie: He’s not dead yet? Portly man dressed in white with green apron rushes onstage and speaks breathlessly: PeterBOY: (in a rush). Mr. Godot told me to tell you he won't come this evening but surely tomorrow. Monny: You work for Mr. Gordo? Boydie: What do you do? PeterBOY: I mind the sheep, Sir. Monny: I wonder if we wouldn’t have been better off doing something else. Boydie: Let’s revisit that idea of hanging ourselves. The two bums exit stage left. It reminded me of the story of Beckett and Joyce in Paris.